Last weekend, Len and I took a mini trip to Smithfield, North Carolina with our neighbors to get some delicious local ice cream. If you’re from the Raleigh, NC area, you know there’s not much to find in Johnston County. But it has a lot of character! Many don’t even know that there is a small airport there! So what’s so special about this small local ice cream stand? Well, maybe I’m a little biased, but the owners of Sam’s Flying Scoops are dear friends of mine. As a matter of fact, I even designed the logo! That was a really fun project and I was so excited when Bob and Shannon asked me to help them with it! 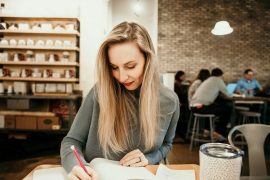 I love small local family-owned businesses, of course I want to help one grow! 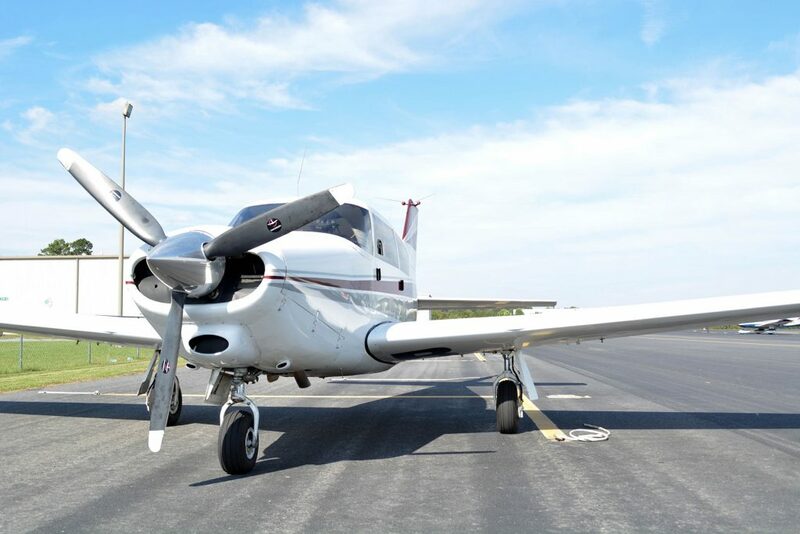 Bob and Shannon met in Pennsylvania about 18 years ago and aviation was a huge part of their lives since Bob had received his pilot’s license shortly before they met. (Fun fact: Bob took Shannon for a plane ride to Atlantic City from Pennsylvania on their first date!) Being at a small airport in Pennsylvania, there was a certain camaraderie amongst pilots and their families and even the local community. On any given weekend there would be an abundance of people at their little airport hanging out and watching the planes. A really fun and popular thing to do is fly for food. Go in search of the $100 hamburger. 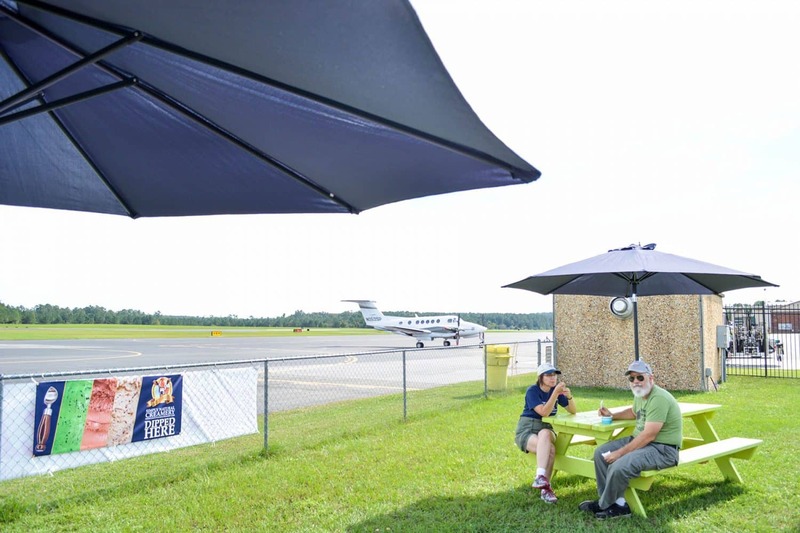 Lots of airports in the northeast have restaurants in their fields. Bob and Shannon had made a lot of friends “flying for food” in PA. When they moved to North Carolina 14 years ago, they found that this activity wasn’t so popular. Since then they haven’t met many “airport friends” nor have they seen people “hanging out” at the airport or the community coming together to watch, either. 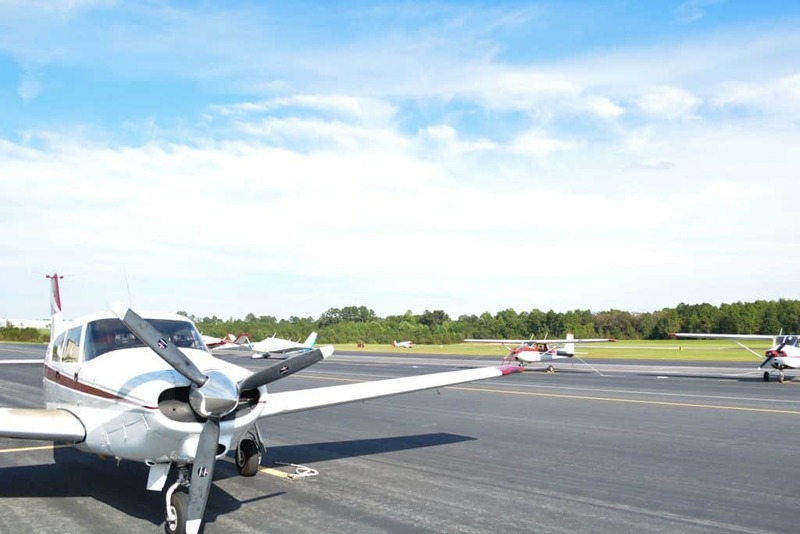 A shot of Bob and Shannon’s 4 passenger plane near the runway at the Johnston County Airport. 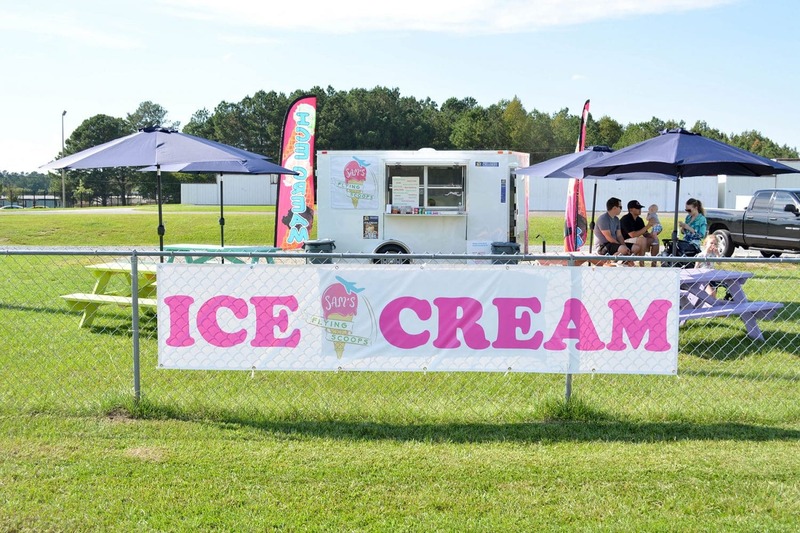 “Our hope is to bring the community out, bring a new awareness for private aviation, forge lifelong friendships, and employ some local youth,” Shannon said after asking her the reason for starting this local ice cream stand at a small airport. And really, who doesn’t love ice cream? 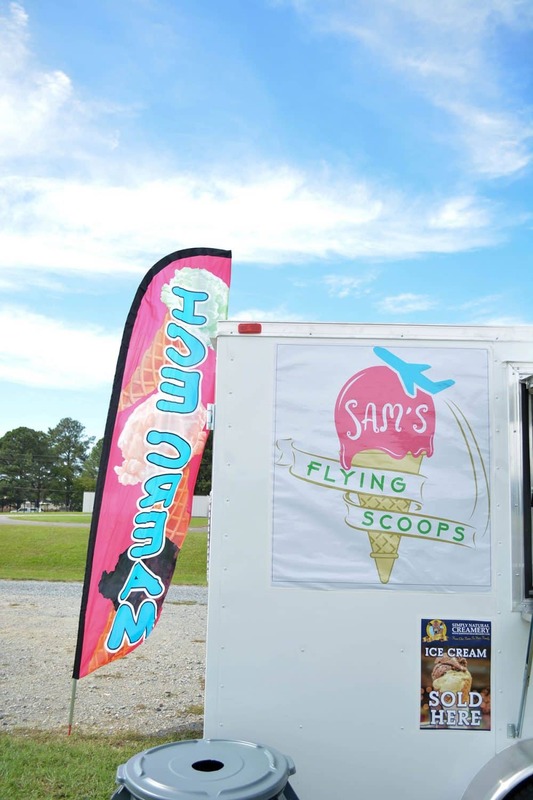 Sam’s Flying Scoops is named after Bob and Shannon’s 10 year old daughter, who you will see helping out on the weekends. 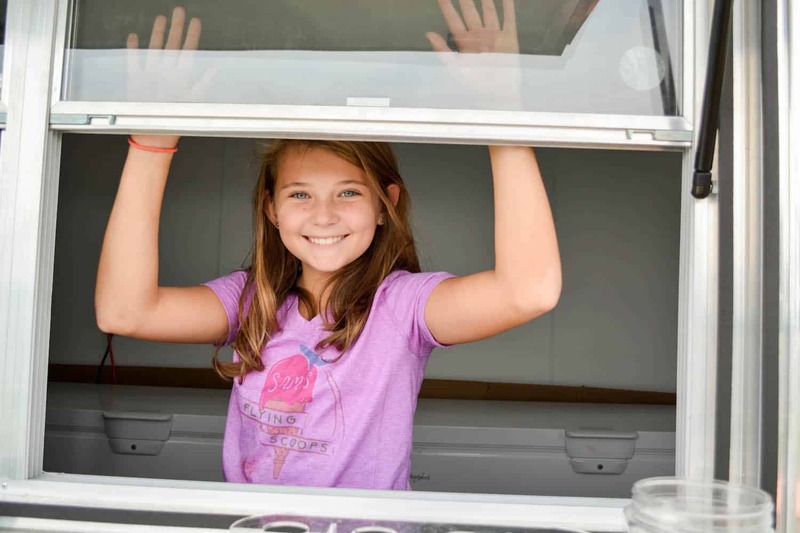 If you’re wondering where they get their ice cream, it’s local, too! 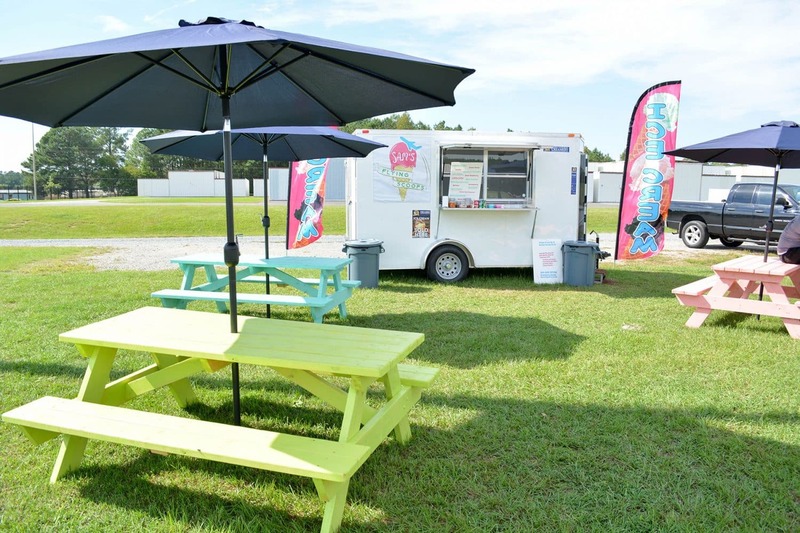 They get all 19 flavors (2 non-dairy for those sorbet lovers) from Ayden, NC’s Simply Natural Creamery. Simple Natural Creamery is basically your one-stop-dairy-shop, if you will. They use jersey cows, which while they don’t produce as much milk, they produce a much richer and creamier milk. And let me tell you, they make some delicious ice cream. Everything is done right there, and it is very cool to see! 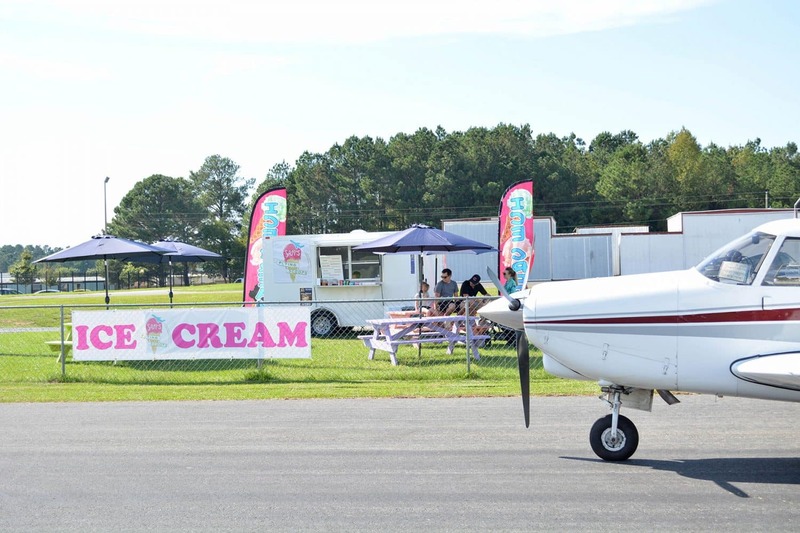 So, if you want a new adventure that you’ve likely never done in the RDU area, I highly suggest you head out to the Johnston County Airport on a beautiful day to grab some ice cream and watch some airplanes. Who knows, you might learn a thing or two you never knew before about airplanes! 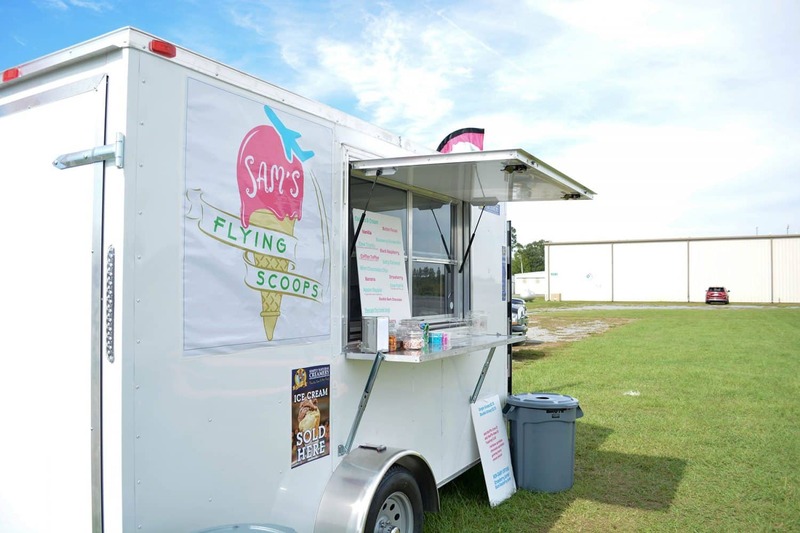 Until October 17th, Sam’s Flying Scoops is open Monday-Thursday from 2:30 to 7:00pm, Friday and Saturday from 11:00 am to 7:00 pm, and Sunday from 12:00 pm to 6:00 pm. Starting October 17th, they will be open Monday-Thursday from 2:30 pm to 6:00pm, Friday and Saturday from 11:00 am to 7:00 pm, and Sunday from 12:00 pm to 6:00 pm. 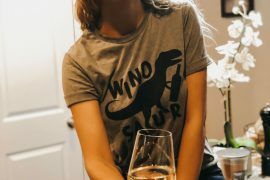 Want to learn more and stay up to date with everything going on with Sam’s Flying Scoops? Go like their Facebook page! 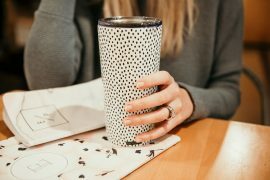 Support a local family-owned business today! 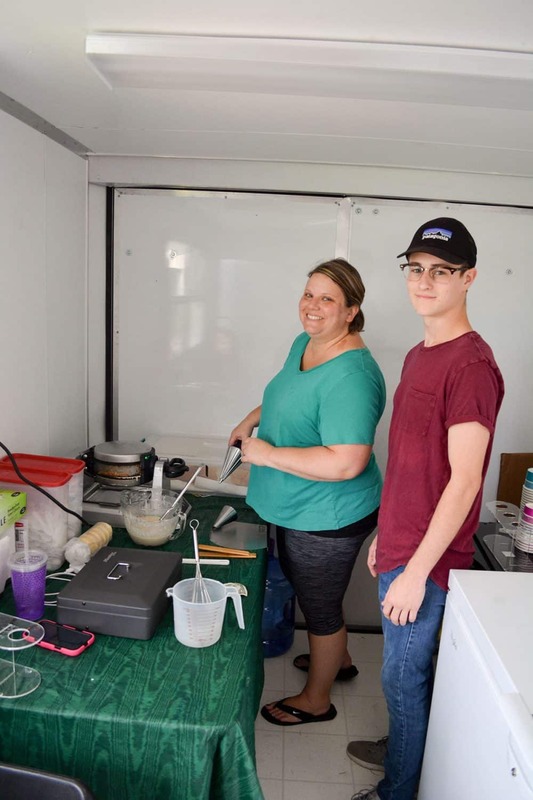 Shannon teaching Evan how to make waffle cones. It smelled so good in there!